The Vulcan, a delta wing subsonic jet bomber served with the RAF for over thirty years and fulfilled a central role as part of Britain’s nuclear deterrent in the Cold War. Design work started as early as 1947 by Avro’s chief designer Roy Chadwick, who utilized development work completed by Professor Alexander Lippisch during the Second World War. The Air Ministry issued Specification B35/46 in 1946 for a bomber that could achieve a top speed of 575mph, operate at 50,000 feet, have a range of more than 3,000 miles and that could carry a bomb payload of 10,000lb. Vickers-Armstrongs and Handley Page also put forward designs to the Air Ministry as well as Avro. 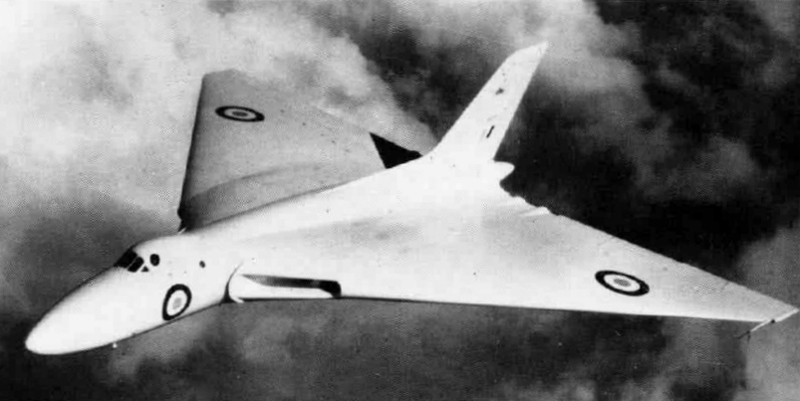 All three were approved and the RAF’s V-force took shape with the Vickers Valiant, the Handley Page Victor and the Avro Vulcan. Sadly, on 23 August 1947 the Vulcan’s designer, Roy Chadwick was killed in an air crash when the prototype of the Avro Tudor 2 that he was travelling in came down. His work on the Vulcan was continued by Stuart Davies, who took over as Avro’s chief designer. In 1948 an experimental prototype, the single-seater Avro 707, was built but it crashed on 30 September 1949. Subsequently, four other versions of the 707 were constructed. The Avro Type 698 prototype VX770 made its maiden flight on 30 August 1952 with Avro’s chief test pilot, retired Wing Commander Roly Falk, at the controls. The aircraft’s outstanding manoeuvrability was later demonstrated at the Farnborough Airshow in 1955. The Vulcan B2 strategic bomber was 99 feet 11 inches in length, had a wingspan of 111 feet and stood 27 feet 2 inches high. It was powered by four 20,000lbf Bristol Siddeley Olympus 301 turbojets that gave it a maximum speed of 645mph at high altitude, a range of 4,600 miles and an operational ceiling of 65,000 feet. The first Vulcan that was delivered to the RAF was XA897 in September 1956. Air Chief Marshal Sir Harry Broadhurst, Air Officer Commander-in-Chief Bomber Command, took the Vulcan, with a full crew, on a round-the-world tour, with Broadhurst occupying the co-pilot seat. On 1 October 1956 the aircraft returned to the UK and attempted to land in bad weather at London’s Heathrow Airport. The Vulcan struck the ground 2,000 feet short of the runway and bounced back into the air. The pilot, Squadron Leader DR Howard, and Broadhurst both ejected and survived. The remaining four crew members were killed. After his retirement in 1961 Broadhurst became managing director of Avro, then managing director of Hawker Siddeley in 1965 and finally a director of Hawker Siddeley Group Limited in 1968 before taking full retirement in 1976. In 1982 the RAF used Vulcan bombers to attack Argentine positions on the Falkland Islands through a number of very long-range missions that were codenamed Operation Black Buck. In all, seven operations were planned and five were put into effect. The aircraft flew 3,889 miles from Ascension Island in the South Atlantic to the Falkland Islands. The first attack took place on 1 May when a single Vulcan bombed Port Stanley’s main airfield. A further four missions targeted the airfield and Argentinian radar installations. Handley Page Victor aircraft assisted the operation with in-flight refuelling, with each sortie consuming some 1.1 million gallons of jet fuel. From Heroes and Landmarks of British Aviation by Richard Edwards.